Gov. Andrew Cuomo on Friday blasted fellow Democrats who lead the state Senate, calling the opposition to Amazon’s project in Long Island City “absurd” and “political pandering” while also urging a collection of business leaders on Long Island to restore “sanity” to the chamber by opposing a tax increase on the rich. At the same time, Cuomo suggested Democrats in the Senate writ large could face a political backlash from voters if the Amazon deal to bring up to 40,000 jobs tied to nearly $3 billion in tax incentives were to fall through. The comments, taken together, amounted to declaration of open war between the governor and Democrats in the chamber who gained a working majority in a landslide election in November. The speech was the governor’s most forceful public response to date against the opposition to Amazon’s plan for converting office in Long Island City in Queens and the tax credit package that is being offered. Senate Democrats earlier this week announced a prominent critic of the proposal, Deputy Majority Leader Mike Gianaris, would be nominated to the Public Authorities Control Board, which could have veto power over the deal. Gianaris has called for the proposal to be re-negotiated. In addition to the tax incentives, lawmakers and elected officials in New York City have been discomfited by Amazon’s declaration it would oppose efforts to unionize its workforce. The Washington Post reported just before Cuomo’s speech on Long Island that the online retail giant was reconsidering its New York plan, which is also being paired with a campus in Virginia. In his remarks, Cuomo said blame for the deal falling through would be squarely on the shoulders on those who opposed the plan. “If Amazon does not come to New York, it is because of the political opposition,” Cuomo said. The labor groups that have opposed the deal, however, insisted it was the mishandling of the Amazon proposal in the first place. Meanwhile, Cuomo also opened another line of attack against Democrats in the Senate: Taxing the rich. 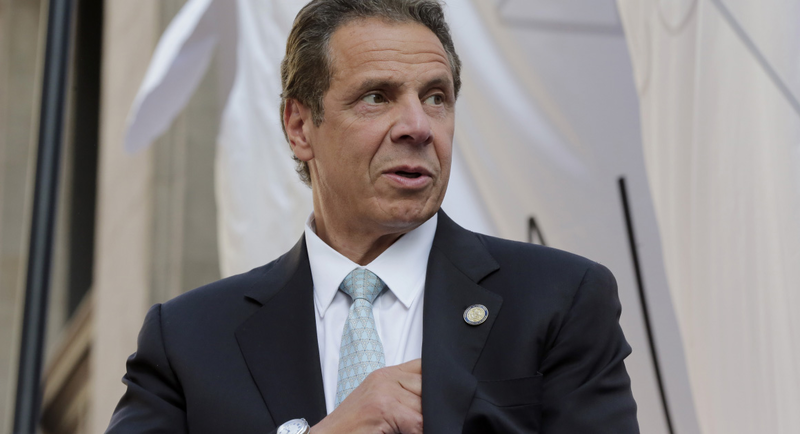 Cuomo said Democrats there are backing an effort to increase tax rates on the rich as the current rates for the personal income tax expire at the end of the year. Cuomo has signaled he wants to keep the current rates as they stand. The $10,000 cap on state and local tax deductions has resulted in $2.3 billion less in tax revenue, Cuomo said, and higher taxes could lead to more wealthy people leaving the state. New York relies on a handful of very rich filers for 46 percent of its revenue. Democrats have not signaled they plan to raise taxes and last month approved a bill permanently extending the state’s cap on property taxes. “Not sure where the Governor is getting his ‘fake news’ from but Senate Democratic Majority Leader Andrea Stewart-Cousins has made it clear we are not looking at raising taxes,” said Senate Democratic conference spokesman Mike Murphy. Cuomo spokesman Rich Azzopardi pointed to a bill introduced by Gianaris this week that would raise taxes on upper income earners in order to fund mass transit. The Senate for the last decade has been a flash point for partisan warfare. For most of Cuomo’s tenure as governor, the Senate has been under the control of Republicans, who had joined into an alliance with a bloc of breakaway Democrats known as the Independent Democrats Conference. Liberals had long chaffed at the arrangement, charging the IDC-GOP alliance was tacitly endorsed by the governor and stalled long-sought progressive bills. That changed last year when Democrats won a 16-seat majority in the 63-member conference. Cuomo himself campaigned for Democrats in key swing districts on Long Island and in the Hudson Valley. In the last month, Cuomo has cheered a flurry of bills to pass the Senate and Assembly that are meant to make it easier to vote, bolster abortion and LGBT rights as well as new gun control measures. But the tension had remained between the governor and the Senate Democratic conference, which is led by Sen. Andrea Stewart-Cousins, the first black woman to lead a majority conference in Albany. Stewart-Cousins and Assembly Speaker Carl Heastie have been publicly aligned on key issues over the last month. Both have signaled their concerns with the Amazon plan.